I recently had the opportunity to try out Mindprint Learning with Zoe. I was provided with a 1 year subscription, so that I could try out the service in exchange for my honest review. All opinions are my own. The process of using the Mindprint Learning website was really simple. They start out with a questionnaire for you to answer about your child... from medical history, to developmental milestones, to a school history, and which hand is dominant for writing. They then have directions for preparing your computer, preparing the work space, and preparing your child. I really liked that they had this video available for Zoe to watch before starting. She was a little anxious about what I was having her do. And... since I hadn't taken the assessment... I couldn't tell her exactly what she was going to be doing. Zoe seemed to enjoy most of the little "games". I could tell when something was a little boring for her... and when something frustrated her. There was one section that REALLY annoyed her because it kept changing what exactly she was supposed to do... but I think the point of it was to see how long it would take her to figure each switch out. She had no problem finishing the assessment... and she never asked to quit before it was completed. She wouldn't say it was "fun" but she did say it wasn't anything like the tests she's had to take at school. Full reports provide detailed descriptions of all 10 skills assessed, their impact on learning, and how best to approach strengths and weaknesses. My biggest negative about the site? The Mindprint assessment is for children 8-21... and, after seeing what Zoe was doing on the computer, Ana REALLY wanted a turn... but she only just turned 7. I guess that just goes to show you that, while this IS a learning tool... and essentially a "test"... it really is set up so that the child is relaxed and enjoying the activities. With no stress... 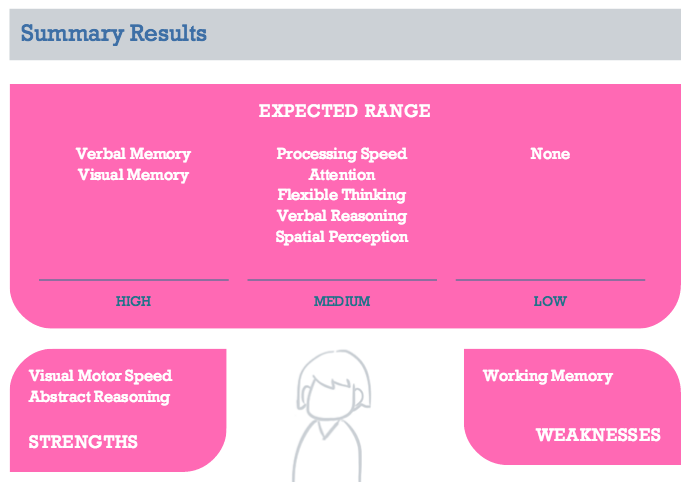 I think it's a much more honest evaluation of skills than if the child was full of anxiety. Also... I wanted to take the assessment for myself!!! I LOVE doing all of the "quizzes" and "puzzles" that Zoe got to do. And, it would be really interesting to see what they come up with for my own learning strengths and weaknesses. On the bright side... when I tried to add myself for an assessment, it says "Coming Soon". I'll definitely try it for myself when it's available. While we did get a complimentary membership at Mindprint... I did make sure to check out the fees. Mindprint Learning Assessment and Tool Kit has a fee of $199 for a year membership ($15.31 a month). It includes the assessment (which you can take repeatedly over the year), the personal learning profile (which you new from each assessment taken), and unlimited use of the toolbox (which includes learning strategies and suggested iOS apps). There is also a 10% discount on sibling assessments. I thought it seemed a little expensive, but when I looked into what it would cost to take your child to a Learning Center of any type to get a similar assessment done it would generally cost more. I like the idea of using this site as a starting point. It could be once you understand a little about how your child best learns, it's enough. OR this initial assessment could put you on the right track for additional help. Overall... I'm thinking it's well worth the fee. I did wish the site included a link to the apps they suggested (like to the iTunes store?). I found that if I wanted to get an app on their list I had to go to the App Store and search. Not horrible... but it would be easier if they could link. You can find out more information about Mindprint Learning on their website, or by visiting Twitter, Facebook, and Youtube.